Since the university where I work is right next to the main train station, most of my Swiss-watching (pun very much intended) takes place in the station. The Swiss are interesting, particularly when it comes to weapons in public. It’s common to see guys with slung SIG SG 550’s walking around the train station as they head off to military training, the range, etc. Nobody pays these guys any mind whatsoever; it’s just part of what’s normal here. Even rather unusual things, like the guy wearing a full-body ghillie suit with a rifle slung on his back buying a cup of coffee from the McDonalds, go completely unremarked-upon by anyone here. It’s amusing to think of Swiss Wookie-suiters?being a thing. In 1978 there were only 89 breweries in the entire United States. In 2013? 2,538, with 2,483 of those being craft breweries. The rifle is full-auto and was purchased outside the US (i.e. they don’t need to comply with the NFA hoops), and they’re returning to a US port and the gun would not be legal. 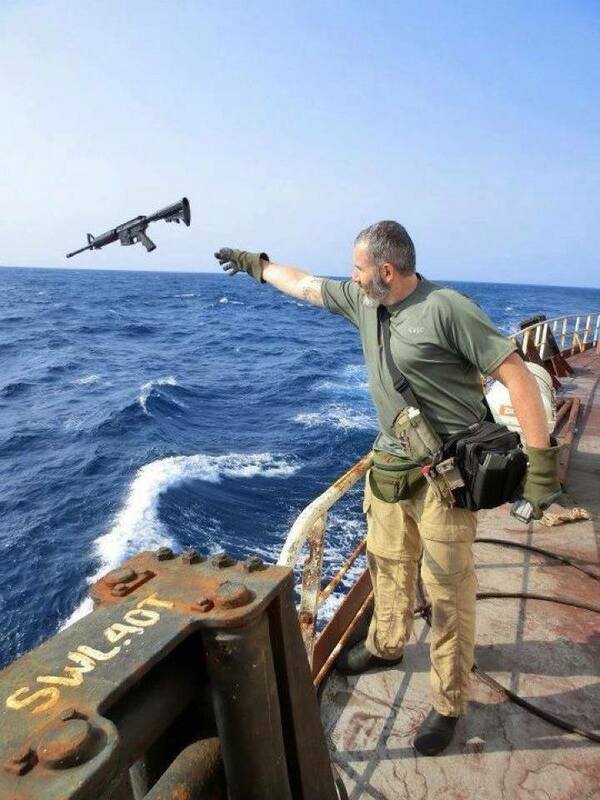 It’s cheaper and easier to simply discard the rifle overboard and buy another one once they leave US waters than deal with the NFA. Essentially the same situation, only they’re docking in some other port where firearms are restricted regardless of if they’re full- or semi-auto. Thoughts? Speculation? I suspect that #2 is a bit more likely. Author azriflemanPosted on May 8, 2014 Categories Guns, Military, NFA, Travel1 Comment on Rifle overboard! Scottsdale police are no longer permitted to cite or arrest someone solely on the basis of being incapacitated by alcohol in public. The court maintained that it was clearly the state’s intent at the time to treat alcoholism as a disease rather than criminal behavior, unless a person under the influence was also engaging in activities, such as driving. Makes perfect sense to me, but then I live in Switzerland where the drinking age for wine and beer is 16 (18 for spirits), drinking in public is perfectly legal, and it’s quite common to see teenagers enjoying a beer while chatting with friends in a park or on the sidewalk, businessmen having a drink on the train ride home, etc. I’ve even seen soldiers on their way to training get onto a train, place their duffel bag and unloaded rifle on the luggage rack, then have a beer. The horror. So long as someone is not violating other laws or being dangerously unsafe (such as driving while under the influence, being rowdy and disorderly, trespassing, threatening others, etc.) I have no problem with them?being peaceably intoxicated whether in private or public. If they start causing disruptions, then there’s a problem, but otherwise I see no issue. Scottsdale police Sgt. Mark Clark said officers didn’t often use the ordinance when it was in effect. Typically, those who demand the attention of law enforcement are committing another crime as well, he said. Clark said there are other tools police can use to ensure the safety of those who are inebriated. An officer may help someone get a ride home or cite them for another violation, such as disorderly conduct. Supporters of increased controls over guns in Vermont accepted the fact that legislation was going nowhere in 2014. When lawmakers declined to vote this year on gun-control charter changes passed by Burlington voters in March, gun control supporters opted against raising a ruckus. Next year will be different, they said Tuesday. “2015 will be the year,” Ann Braden, president of Gun Sense Vermont, at a Statehouse news conference. The group’s singular focus next legislative session will be to pass a law requiring criminal background checks for all gun transactions, she said. – Burlington Free Press, via Jeff Soyer. Obviously, with its lax gun laws Vermont is a violence-infested hellhole. Oh, wait. It’s not. At all. Considering the blowback that politicians get whenever they propose gun control and its unpopularity among?the public, it’s no surprise that this group wants to wait until after the midterm elections before pushing their extreme agenda. Pretty much any group that says “Everyone loves us and the ideas we espouse, but we’re going to wait until after the election to push those ideas.” is a group you want to avoid. If it’s a good idea and you think you have public support, why put it off until later? ?We have to rein in what has become [an] almost article of faith, that anybody can own a gun anywhere, anytime. And I don?t believe that,? [Hillary Clinton]?said. Why? If people are?peaceful, non-violent people, why does it matter if they have guns or not? Should violent criminals and the dangerously mentally ill be blocked from possessing firearms? Certainly, but considering that the vast, vast majority of people are ordinary, responsible, peaceful people it seems silly to worry about them responsibly owning and carrying?arms. Clinton, who argued it was possible to hold her position and still support the right to gun ownership, warned that unfettered access to guns could have dangerous consequences. She called the country?s approach to guns ?way out of balance,? and referred to cases in which gun violence has erupted over minor issues. I fail to see how overturning restrictive, unconstitutional laws and restoring liberty is somehow “way out of balance”. I’m not sure what sort of cognitive gymnastics are needed to simultaneously think that restricting the right to keep and bear arms is somehow also supporting that?right, but such a performance would be worthy of an Olympic-level gymnast. And yes, while violence involving firearms has arisen over minor issues, overall gun violence is way,?way down since the time her husband was in office, even though the number of guns in private hands has dramatically increased and gun laws have been liberalized. She painted a dark picture, warning that, ?At the rate we?re going, we?re going to have so many people with guns everywhere, fully licensed, fully validated, in settings where [one] could be in a movie theater, and they don?t like someone chewing gum loudly or talking on their cell phone and decide they have the perfect right to defend themselves against the gum chewer or cell phone user by shooting.? Clinton continued, ?That?s what happens in the countries I?ve visited where there?s no rule of law.? So people who undergo the training and checks needed to get a carry permit — that is, they’re following the law — are somehow more apt to fits of violence? Seems unlikely to me. Certainly, such incidents have happened but they are the exception rather than the rule, and the people who committed such acts are either in jail or facing criminal charges. It’s nonsensical to compare people who obey the law, get training, background checks, and permits with people in lawless countries. The proliferation of guns combined with few restrictions on where they can be carried can ?give someone the means to respond in the moment in a way that he wouldn?t if a few minutes passed and there was no means to inflict harm ? We really have got to get our arms around this,? she said. I agree with her but not in the way she intends. I wholeheartedly agree that widespread carriage of arms by the public “give[s] someone the means to respond” that they would otherwise lack if they had?”no means to inflict harm”. I think that’s a good thing, because?honest people can defend themselves from violent criminals. Without a gun, the honest person is considerably less able to offer meaningful resistance. While it was always obvious that Mrs. Clinton was never a friend of the Second Amendment or legal gun owners, this is pretty clear-cut evidence that she’s opposed to gun rights.